In yesterdays National Football League playoff games? Some of those calls COULD not be corrected…. Some where NOT called at all…. There in lies the problem’s…. But sometimes thing come out plainly wrong….. The N.F.L. this season finally appeared to have accomplished its goal of “getting back to football” after several years of off-field turmoil that ranged from player misconduct to weekly protests during the national anthem. But the league’s bounce-back season was knocked off stride on Sunday, as officials in the two conference championship games made baffling, controversial calls that to some degree overshadowed the otherwise thrilling matchups. The calls — or noncalls — left legions of fans feeling their teams had been robbed of a chance to advance to the Super Bowl, and left others simply confused. Once again, the conversation Monday focused as much on the meaning of penalties like roughing the passer and pass interference — and why they were or weren’t called — as it did about the outcome of the games themselves. The officiating uproar may lead to even more rule changes, video reviews and coaches’ challenges. Those could make games even longer despite the league’s professed goal of cutting down stoppages. And another debate is likely to ensue about the use of technology, which sometimes fails to provide the closure it promises…. 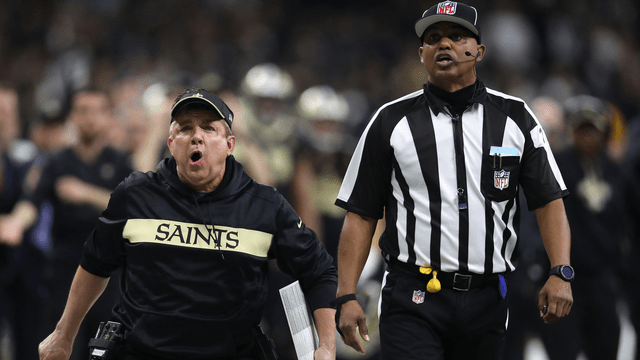 Several eye doctors are offering free exams to NFL referees after a blown call that resulted in the New Orleans Saints’ controversial loss to the Los Angeles Rams in the NFC Championship game. “After having time to consider things we will GLADLY provide no cost eye exams to all NFL officials prior to next season to prevent the atrocity that occurred tonight. We would hate for someone else to feel our pain,” Louisiana Family Eyecare posted….